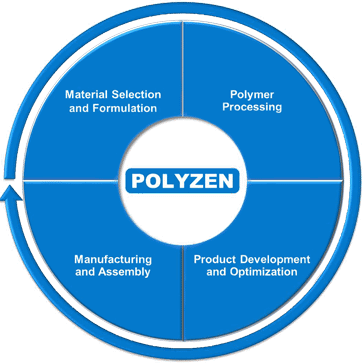 Polyzen is a leading developer and manufacturer of customized polymer-based materials, films, components, and assemblies for the medical device industry. Our range of material and processing technologies allow us to provide optimum solutions for innovation-driven companies, ranging from entrepreneurial start-ups to major medical device manufacturers. From prototype development through full-scale production, we take pride in our quality, technical expertise, and customer service, and we strive to provide the best value throughout the product lifecycle. We’re an innovative developer and manufacturer of custom polyurethane and thermoplastic elastomer films and laminates. Our in-house capabilities and knowledge make us a trusted medical film supplier. Polyzen provides state-of-the-art development and manufacturing for small-diameter, thin-walled tubes and minimally invasive diagnostic and therapeutic devices, meeting all performance and regulatory requirements. We’re a premier manufacturer and supplier of low-pressure and high-pressure medical balloons in standard and custom sizes, shapes, and configurations, using a variety of processes to meet customer requirements. Polyzen is a single-source provider of polymer bags, bladders, and membranes for diverse medical applications. We have the in-house capabilities to manage projects from concept to validation and beyond. We’re a proven leader in protective barrier sleeves and sheaths for an array of medical-industry applications. Our in-house expertise in polymer development and manufacturing covers the most sophisticated devices. Polyzen has in-house expertise in a range of techniques used to enhance the surface properties of plastic parts for an array of medical devices and applications, meeting a broad range of performance requirements. Polyzen offers complete in-house device development and manufacturing services within a fully ISO 13485/ ISO 9001 registered facility and Class 7 and 8 certified clean rooms. From raw material and component sourcing through prototype development and production, our quality and regulatory team is dedicated to providing service and products in accordance with customer regulatory requirements. At Polyzen, our well-documented quality programs ensure consistent quality on which our customers and partners rely. Click below to learn more. From product information sheets to technical white-papers, certifications, processes, policies, and more, click below to access Polyzen’s resources. Our medical-grade polymer films are now available for purchase through Chamfr, an online marketplace for medical device components, designed to help engineers innovate faster. Our films are in stock and ready to ship within 24 hours.